For diverse communities of omnivorous insects such as ants, the extent of direct consumption of plant-derived resources vs. predation is largely unknown. However, determination of the extent of "herbivory" among ants may be crucial to understand the hyper-dominance of ants in tropical tree crowns, where prey organisms tend to occur scarcely and unpredictably. We therefore examined N and C stable isotope ratios (δ15N and δ13C) in 50 ant species and associated insects and plants from a tropical rainforest in North Queensland, Australia. Variation between ant species was pronounced (range of species means: 7.1‰ in δ15N and 6.8‰ in δ13C). Isotope signatures of the entire ant community overlapped with those of several herbivorous as well as predacious arthropods. Variability in δ15N between ants was not correlated with plant δ15N from which they were collected. Ant species spread out in a continuum between largely herbivorous and purely predacious taxa, with a high degree of omnivory. Ant species' δ15N were consistent with the trophic level predicted by natural feeding observations, but not their δ13C. Low δ15N levels were recorded for ant species that commonly forage for nectar on understorey or canopy plants, intermediate levels for species with large colonies that were highly abundant on nectar and honeydew sources and were predacious, and the highest levels for predominantly predatory ground-foraging species. 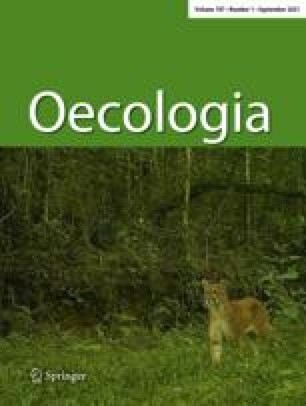 Colonies of the dominant weaver-ants ( Oecophylla smaragdina) had significantly lower δ15N in mature forests (where preferred honeydew and nectar sources are abundant) than in open secondary vegetation. N concentration of ant dry mass showed only very limited variability across species and no correlation with trophic levels. This study demonstrates that stable isotopes provide a powerful tool for quantitative analyses of trophic niche partitioning and plasticity in complex and diverse tropical omnivore communities. We thank Marga Wartinger for technical assistance in the isotope analyses. Taxonomic identification of ants and homopterans was kindly supported by Mary Carver (aphids), Max Day (membracids), John Donaldson (coccoids), Brian Heterick ( Monomorium), Rudy Kohout ( Polyrhachis), Hanna Reichel ( Rhytidoponera), Steve Shattuck (several ant genera) and Mike Webb (cicadellids). Identification of plants was supported on site or in the herbarium by Bruce Gray, Bernie Hyland, Bob Jago, Rigel Jensen and Andrew Small. Diane Davidson, Carlos Martínez del Rio and two anonymous referees provided helpful comments that improved the manuscript. We thank Nigel Stork for his intensive support in Australia and Peter Franks for preliminary isotope analyses in order to evaluate the method. The Australian Canopy Crane Company and the Environmental Research Station in Cape Tribulation provided valuable logistic support. Financial support was provided by the Deutsche Forschungsgemeinschaft (Fi 547/9–1) and by a doctoral fellowship of the Studienstiftung des deutschen Volkes to N. B.
Castanospermum australe A. Cunn.& C. Fraser ex Hook.